Finding the (not so) Elusive Bigfoot! Have you ever seen Bigfoot? If not, you might be missing out, because 3,781 people have--at least they've reported seeing him. 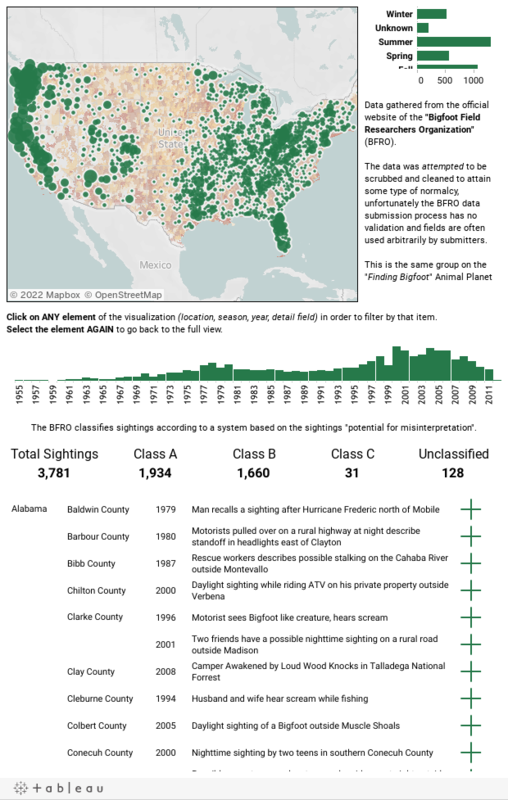 Take a look at this viz to see where people have reported seeing the legendary beast, with data courtesy of the Bigfoot Field Researchers Organization. Bet you didn't know they were real too. This viz is comes from Ryan Robitaille (ryrobes.com), who's also made some rather fun Metallica-related vizes. It's great on many levels. For one, it's beautiful, with strong colors and a neatly organized format. But it also is a great example of a whimsical data set turning into a fun story. What you can create in Tableau is truly limited only by the kind of data you've got--even if it's about mythical creatures. We've made some changes to the viz to fit our blog. Check out the original here. Apparently the bigfoot clan species is quite prolific and getting a larger population every year, making it harder to remain undetected! I am wondering however, if maybe the trend over the last few years may indicate the species is becoming endangered. Maybe someone could get a federal grant to find out if global warming is the cause! (tongue in cheek). We've actually tried requesting a federal grant to study the data. It was about to be approved too, but then unfortunately federal budgetary concerns cut it from the final proposal. It's too bad, really. Bigfoots (Bigfeets?) are an integral part of the American ecosystem and historically been a leading indicator of the economy's health and short-term trajectory. Their loss, especially if attributable to global warming (as you suggest), could be catastrophic and world-ending.